Home > Consumer Issues > What Insurance Precautions Do I Need for Ice Skating? Ice skating is great fun when you travel abroad to snowy climates, and it’s a great hit with the children and adults alike. But as with most winter sports and activities that are rarely practiced at home, ice skating does carry with it a high risk of injury if you’re not used to it...and so there’s a need for insurance precautions. You don’t want to come back from your trip abroad with an injury and a massive medical bill on top of it! Do I Really Need Specific Travel Insurance? Most winter sports insurance policies have a list of activities that they will cover you to take part in on holiday, so if you specifically want to do some ice skating while you’re out there, check the small print before you sign on that dotted line. And make sure you are insured, even if you don’t intend to ski or snowboard... The cost of transport to a hospital by ambulance in Europe, the US or Canada is £300 to £500 – a holiday expense you don’t need. What are the Hazards of Ice Skating? Well, apart from the obvious risks of falling over and hurting yourself – or crashing into other people, there’s the added risk of climate change induced injury – quite literally skating on thin ice! You can’t always tell how safe ice is going to be to skate on just from looking at it – so if you fancy giving it a try, it’s always best to opt for organised ice skating on approved rinks or areas. 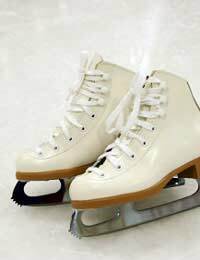 If you are going to take a chance on ice that looks perfect, or if you see a group of people skating and think it might be fun to join them, it’s worth noting that it needs to be at least five inches thick before you try ice skating (or any other activities) on it. Don’t even think about skating on ice that has cracks forming. If the surface of the ice you want to skate on has been covered with snow it will have weakened the ice underneath actually weakened, as snow will have warmed the underlying ice up, so think twice before attempting to walk or skate on it. What Type of Winter Sports Insurance Should I Buy? It’s possible to buy insurance just for ice skating and if that’s the only winter sport that you will be likely to be taking part in, it’s worth doing. A lot of the ice skating policies you see advertised on the Internet are more geared towards coaches and teaching skating to be wary when you purchase a policy that it is actually what you need. One of the best bets is to find a specific winter travel insurance company and ask their advice on which insurance policy would be best for you, for just recreational ice skating. Extreme sports policies are likely to cover the full range of winter sports activities abroad so often a cover all policy is better than a specific one – it depends on cost, and of course whether you think you might want to try other winter sports than just ice skating while you’re out there too!